PZ is talking about Roman Catholic Communion Wafers. Catholics, for those of you not in the know, believe that the consecrated bread and wine of the Mass turn into the literal flesh and blood of Jesus Christ when the priest utters the appropriate magic spell over them. Now, my own Christian upbringing was in the Anglican Church. 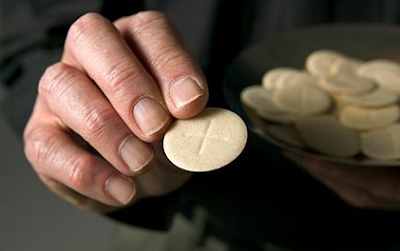 Most Anglican churches use the same flattened disks of bread that the Catholics use, but don't go quite as far in what they believe happens during the consecration. The wafers and the wine are sort of special and have to be treated with unmost reverence, but are not actually considered to be body parts. Fortunately. As a child I avoided the church. My family was nominally Anglican but didn't go to church. Dad wasn't a believer and didn't make any fuss about it. He admired Anglican traditions in a cultural way though. Mum was and still is a sort of a believer in a vague sort of way. Yes, she believes. No, she doesn't have any interest in going to church. My church avoidance centred around the simple fact that I had not been baptised and mum figured I eventually should be. My older brother was baptised as a baby but somehow I missed out, and was in no hurry to catch up. The idea that I would have to stand before a bunch of people and recite lines in a scary ritual and have water poured over me filled me with kiddie terror! I was however, baptised when I was 19. Attending Teacher's College (Wagga Wagga 1972) I fell in with a bunch of Anglicans who also resided in my on-campus dorm. Kevin and John and a couple of others talked me around to it. They were progressive in their beliefs and didn't think lack of official Confirmation in the faith should stand in the way of heathens taking part in the Lord's Supper. So it was that one Sunday they carted me off to St John's Wagga, a quite beautiful country church overlooking the Murrumbidgee River. The priest was Archdeacon Arnold Osborne a truly lovely, gentle man who joined the church in response to the horrors he had experienced as an airman in Europe during World War II. Cutting now to the Holy Communion. My First. Ever. Kevin and John had instructed me on how to hold my hands to receive the Host. I was ready. This was it. I knelt and held out my hands in the Proper Way. Archdeacon Arnold came along and pressed a perfect, circular, pure white disk of plastic into my palm. "The Body of Christ" he intoned, and moved on. I stared at the disk of plastic. It stared back patiently. The cup of wine was approaching. What do I do with this? Is it symbolic? Yes! It must be symbolic of bread! They like symbolism here. I stealthily tucked the plastic disk into my pants pocket. No one noticed and with relief I was in time to take the wine. That was real! Aaah. Port - not bad. Mission accomplished, I returned to my pew and forgot about the plastic disk. That afternoon I was talking about the experience with Kevin and John and raised with them the issue of the plastic disk. "So what was I supposed to do with it?" "You were supposed to swallow it - (pause) - you DIDN'T? What did you do with it?" Kevin and John exchanged a a slightly worried glance. I went to get the pants I had been wearing. Kevin grabbed them and started searching the pocket. Kevin graduated as a school teacher, and later became an Anglican priest, working in the NSW Prison System. My two brothers and I were very good Catholic boys for many years (the nuns often suggested we should be at their school, not that public school opposite) and, one day in the 70s, we had to draw the priest's attention to an emergency - during the Mass. A stray communion wafer had somehow made its way onto the floor! Only the priest could perform the necessary janitorial duties and remove it, since it had already undergone consecration rituals. I was horrified, after an absence of several years, to see that the congregation were now permitted to hold consecrated communion wafers in their human fingers. I was googling today and came across this blogpost which mentions my husband's grandfather, Arnold Osborne. Your kind words about him really struck a chord. He now resides in Hobart, Tasmania where his daughter and loving grandchildren (and grandchildren-in-law! )also live. He is about to turn 92 years of age and is quite ill physically. Despite his ailing condition, he is still very sharp in mind and has an uncannily good memory for people and places. We don't suppose he will be with us for very much longer- perhaps only days. It was very touching to read in your post that he made such an impact on you. We know how special he is and it's nice to know others think of him like this too.